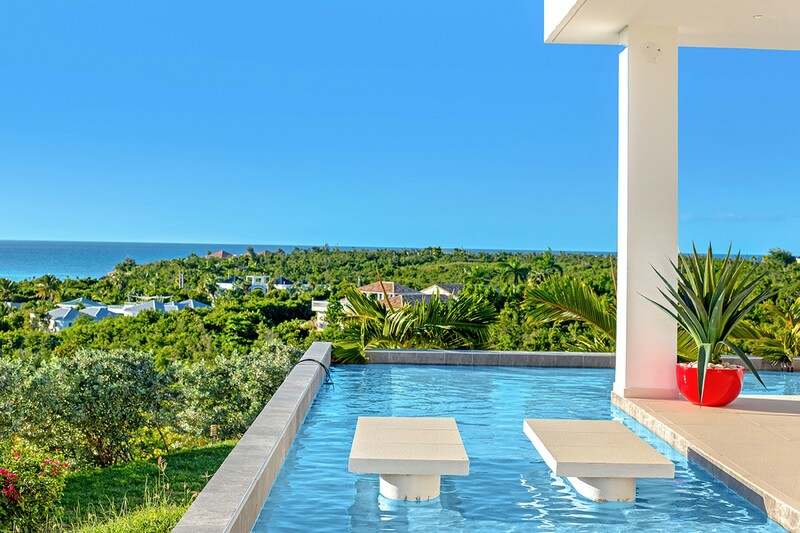 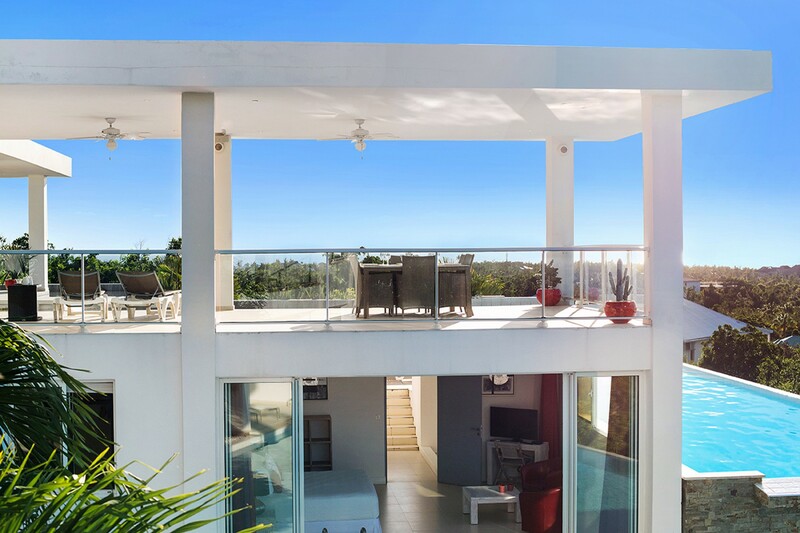 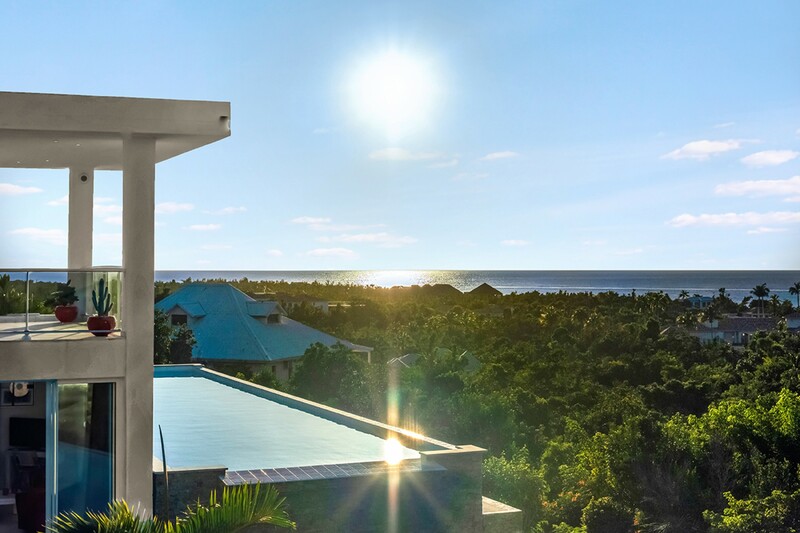 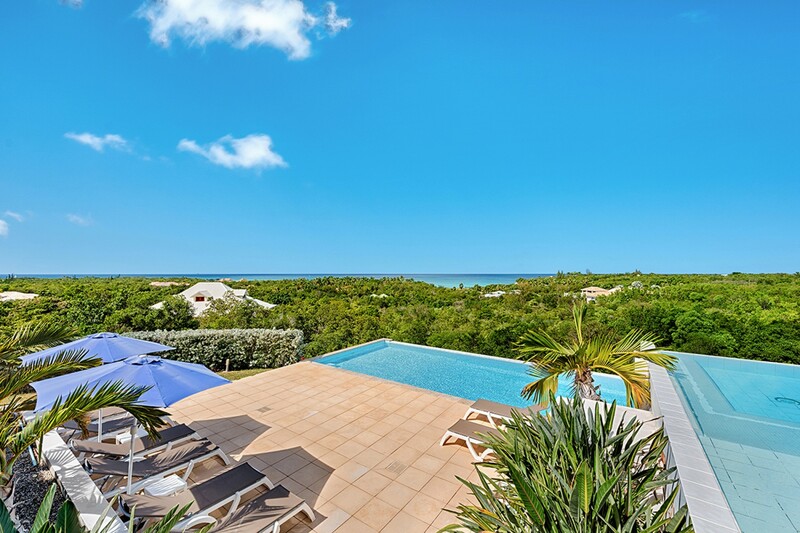 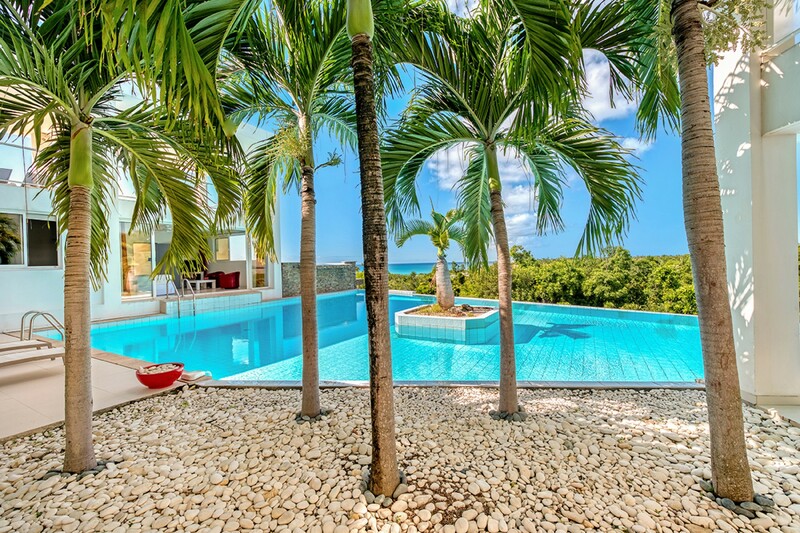 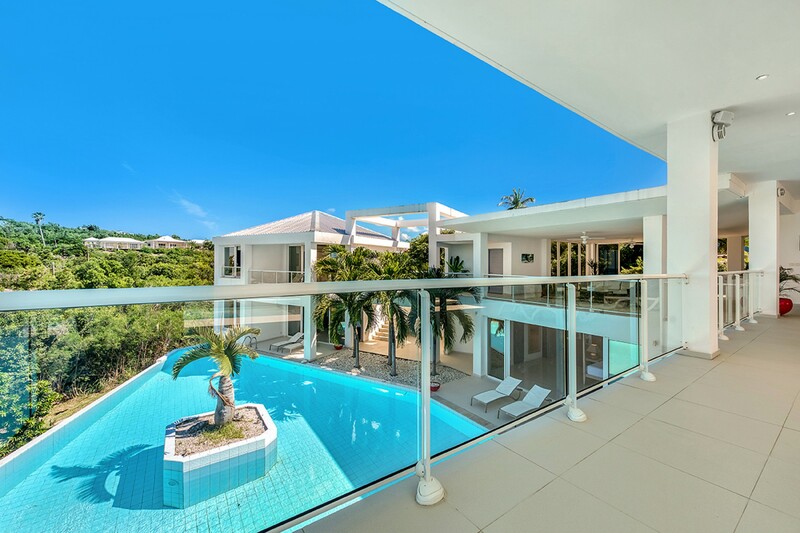 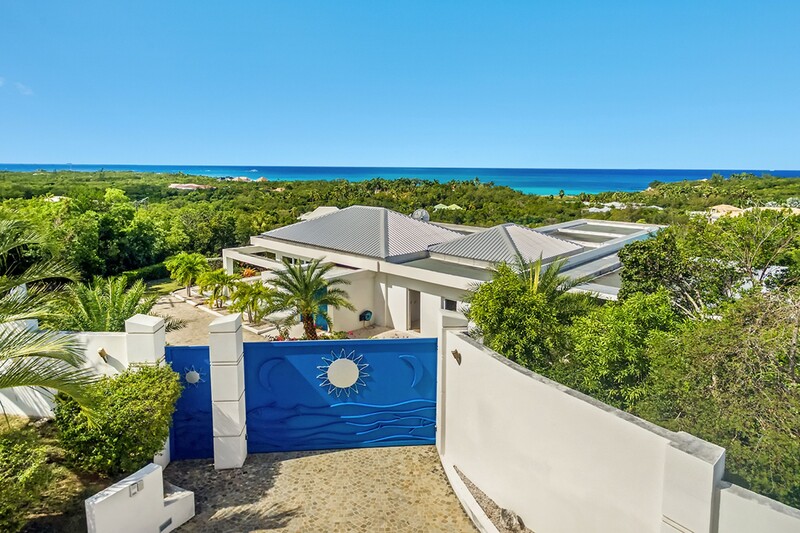 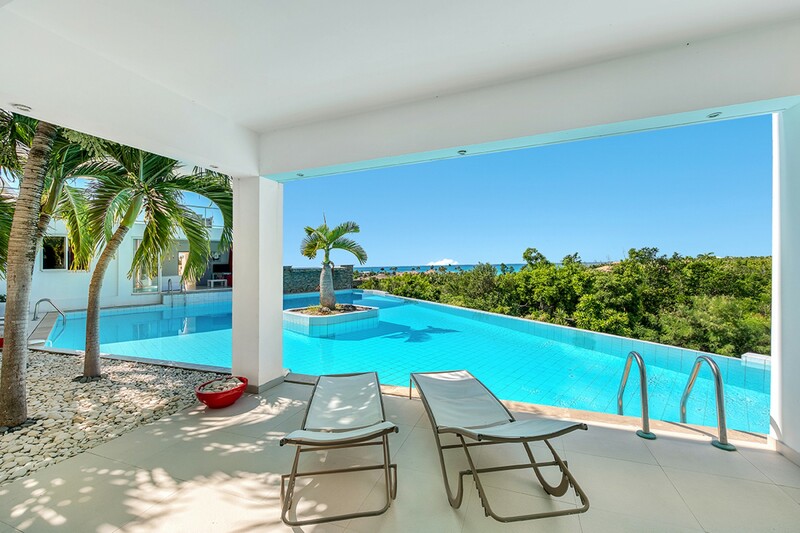 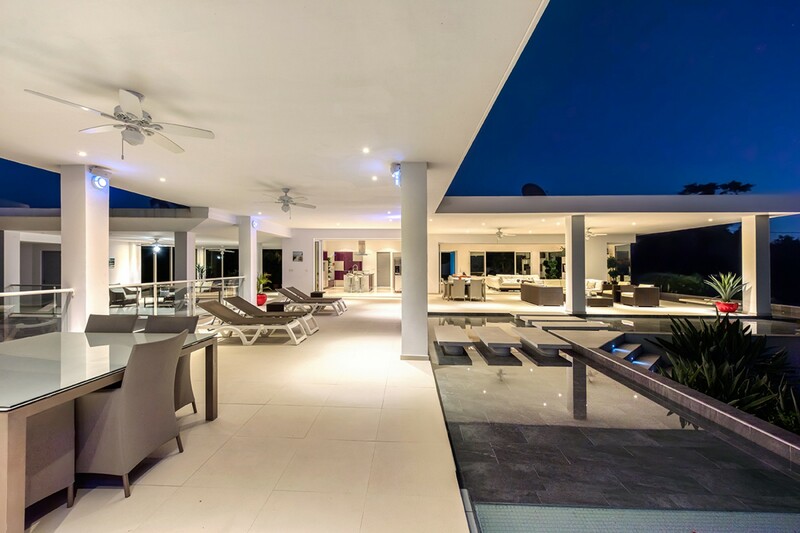 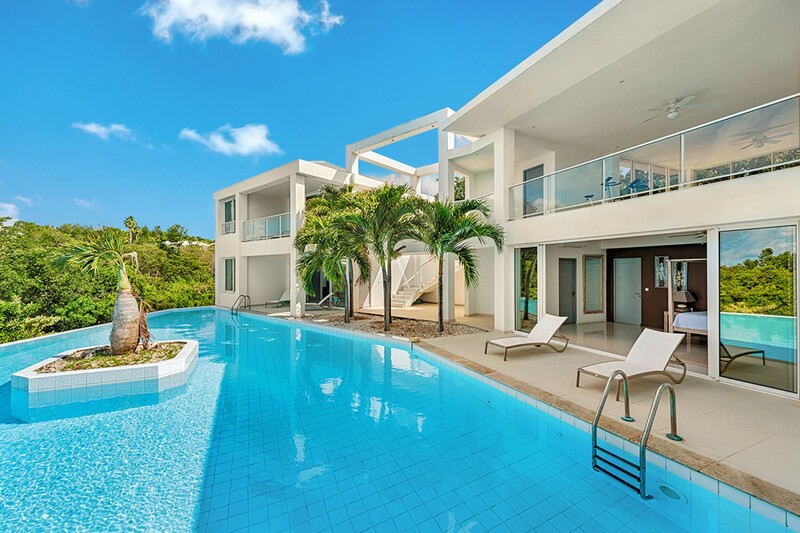 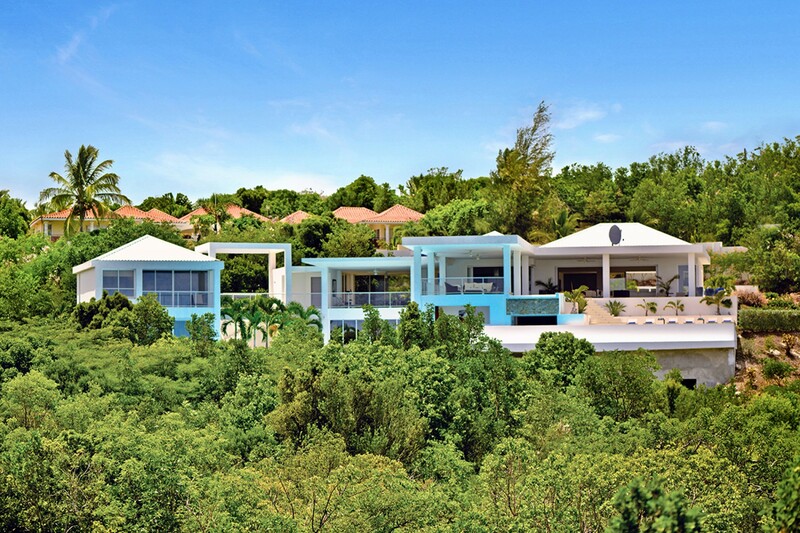 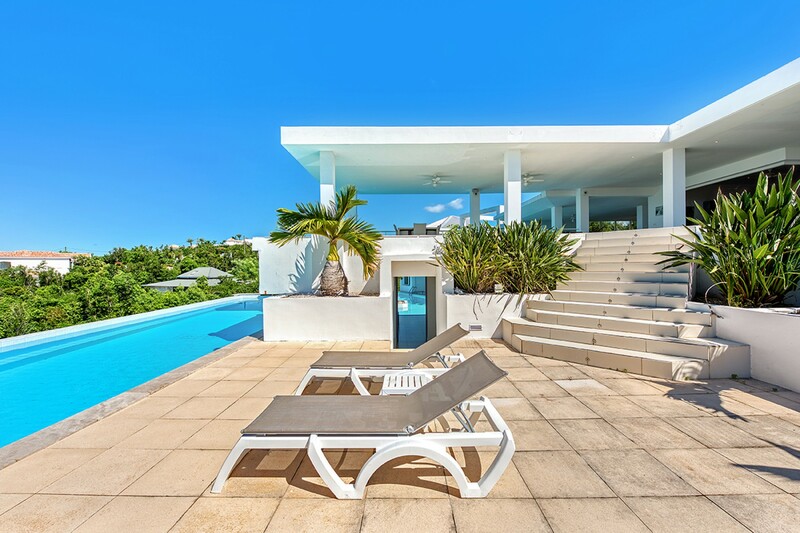 Welcome to Grand Bleu, an exquisite and brand new 4 bedroom contemporary Villa with two stunning infinity private swimming pool sitting on a ridge above Plum Bay Beach with incredible views to the aquamarine sea that will literally take your breath away. 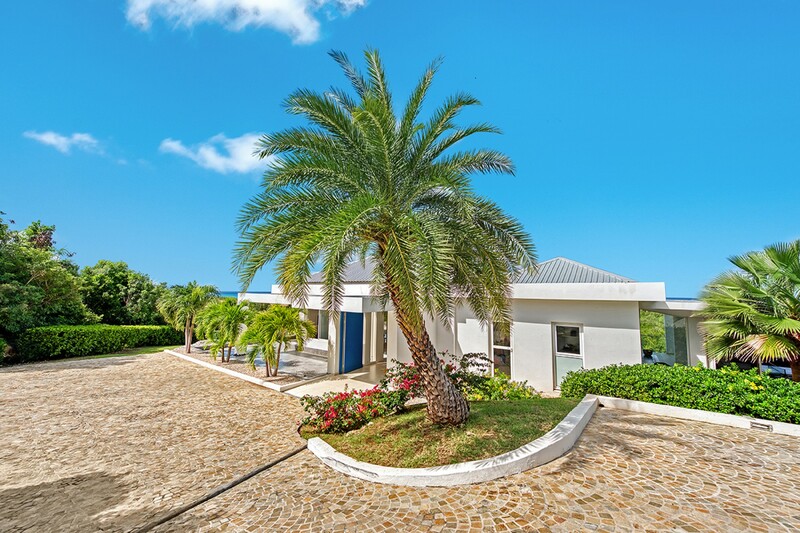 Grand Blue is just a ten minute walk from the stunning beach at Plum Bay, one of the best beaches in St Martin. 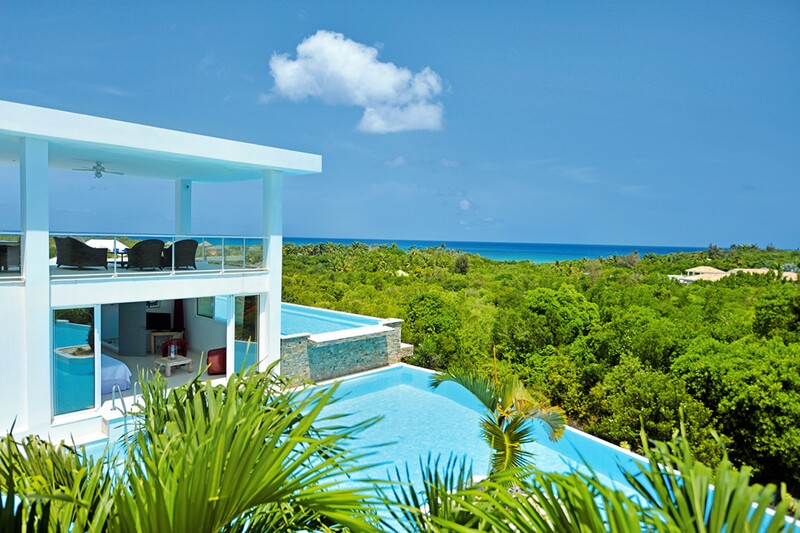 Plum Bay in Terres Basses St Martin is a secluded beach near to Long Beach, where surfers love to play. 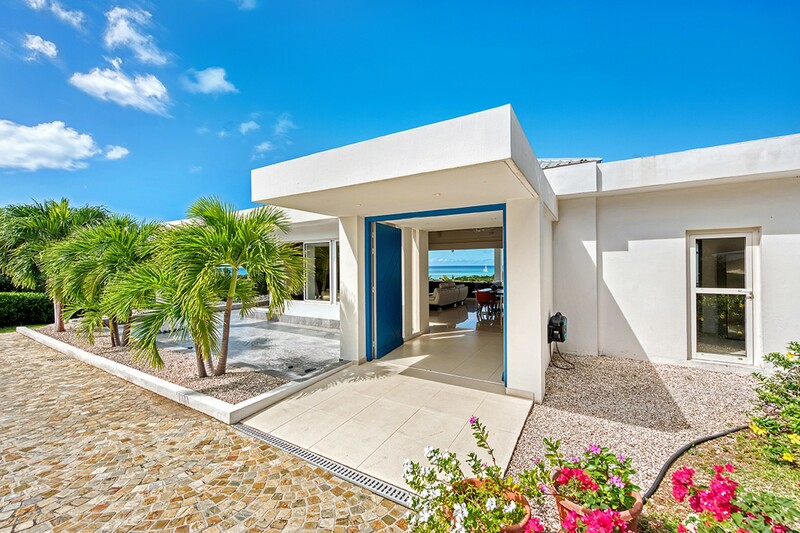 This may be one of the most romantic beaches on the island with calm waters and the chance for a bit of privacy, especially throughout the weekdays. 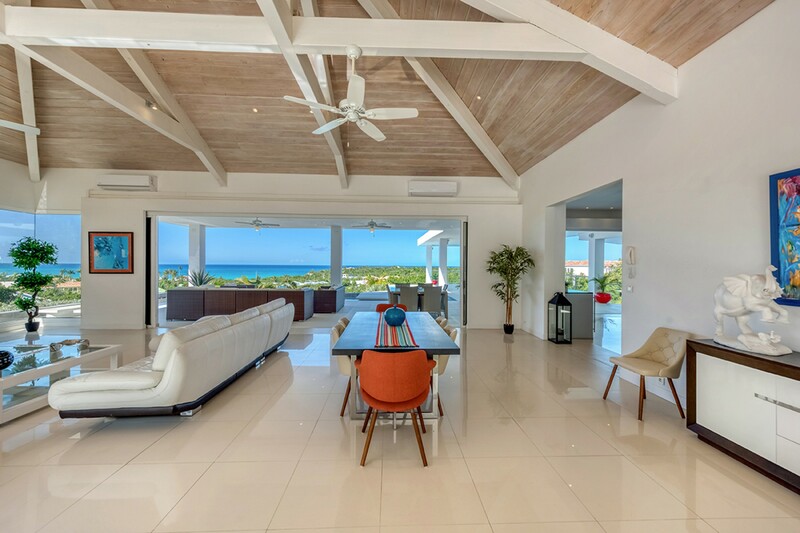 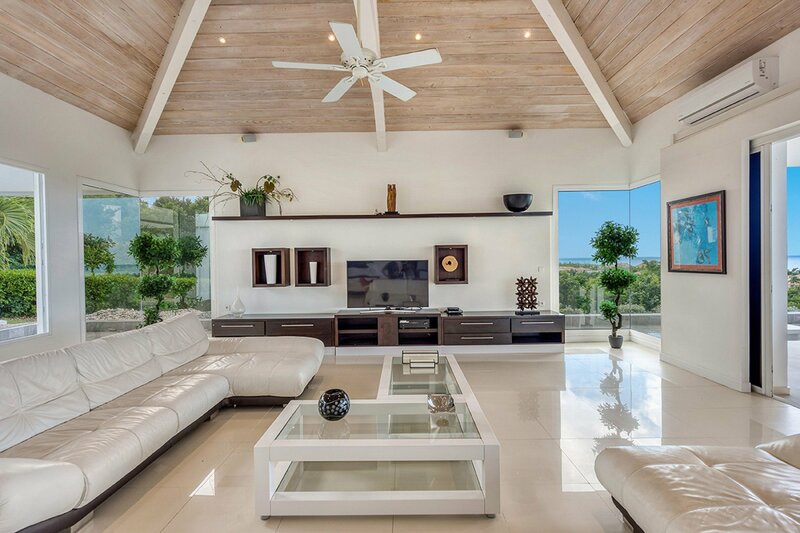 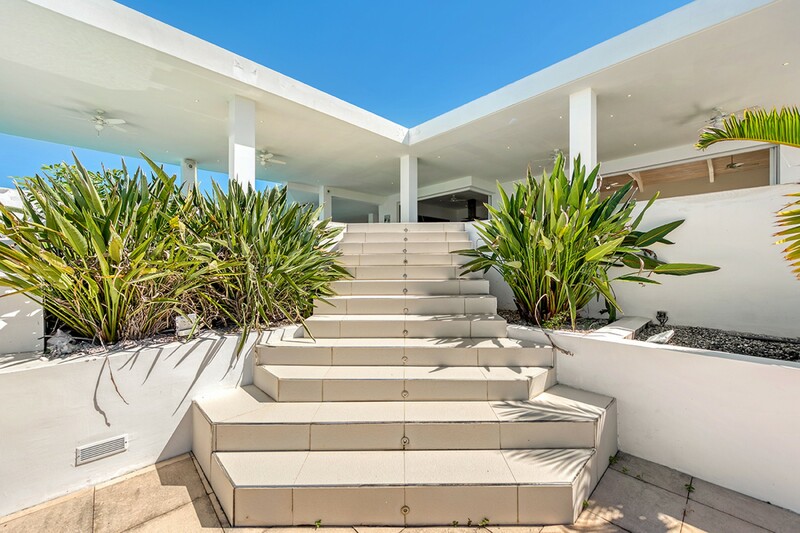 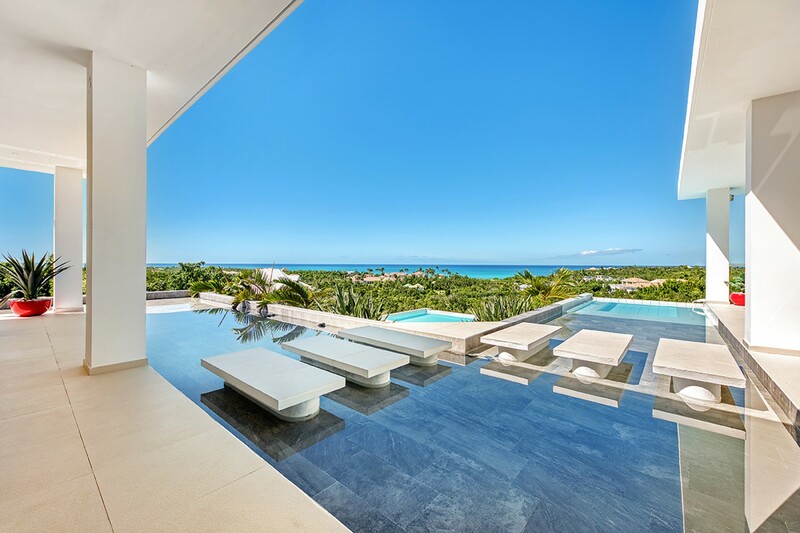 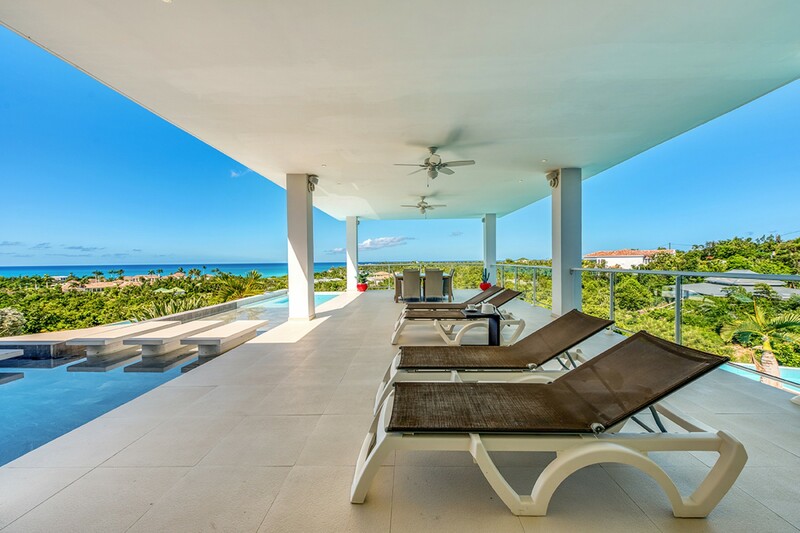 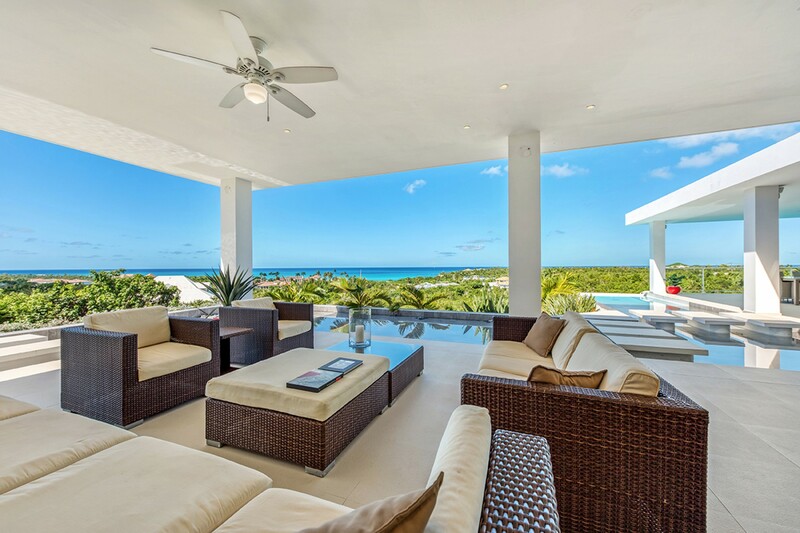 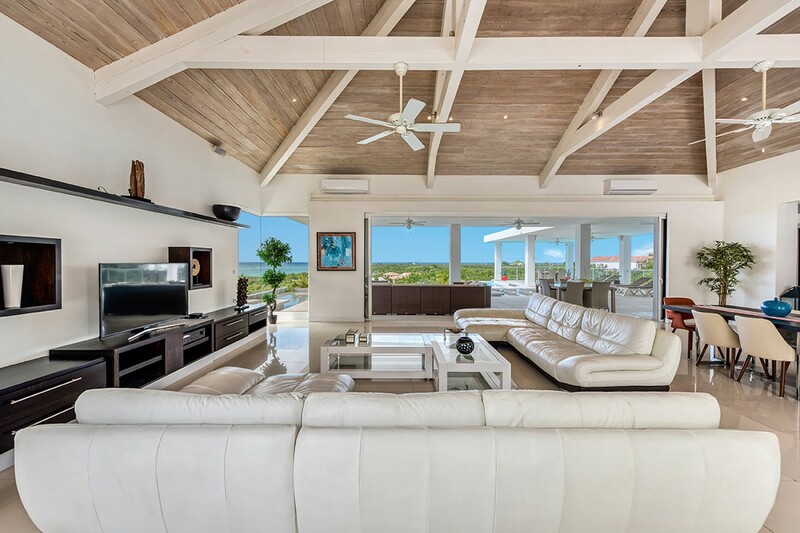 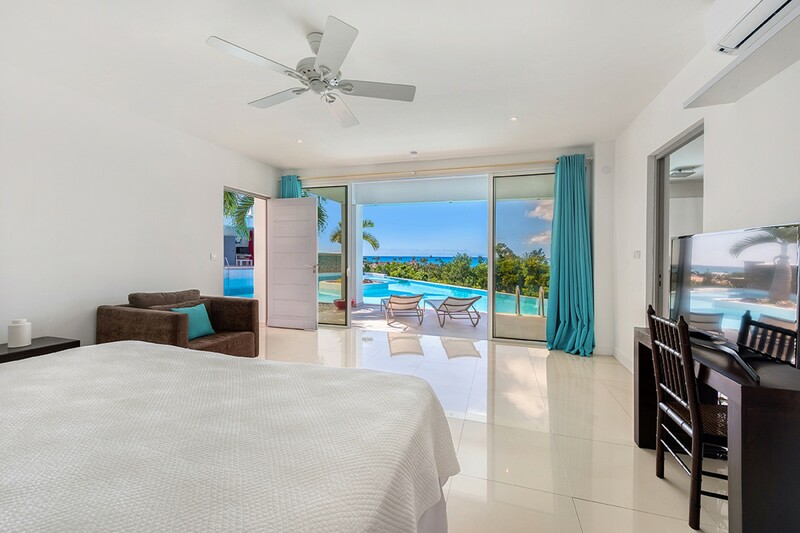 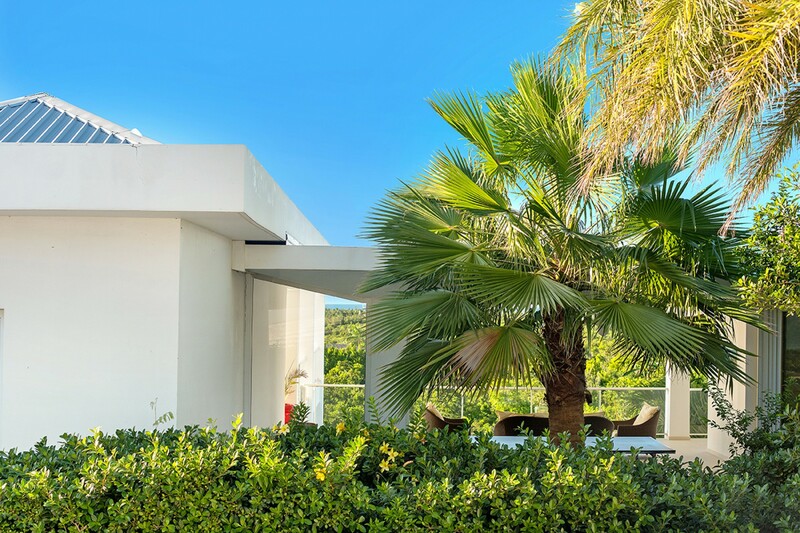 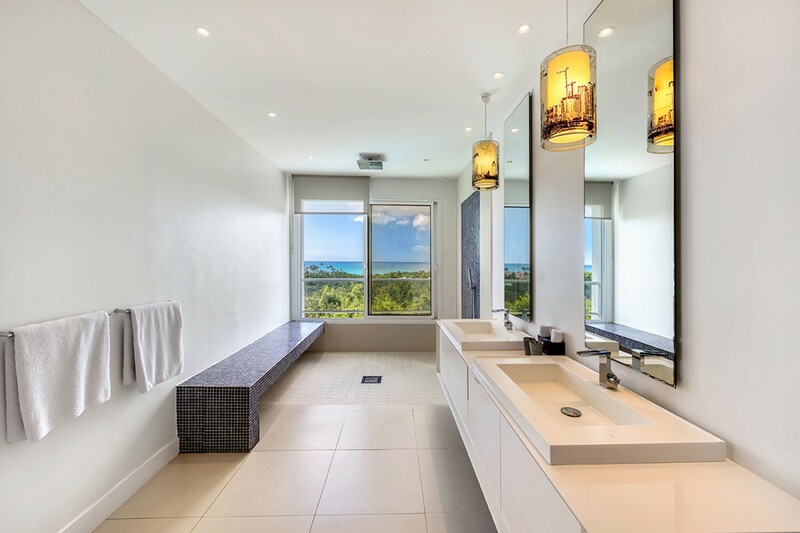 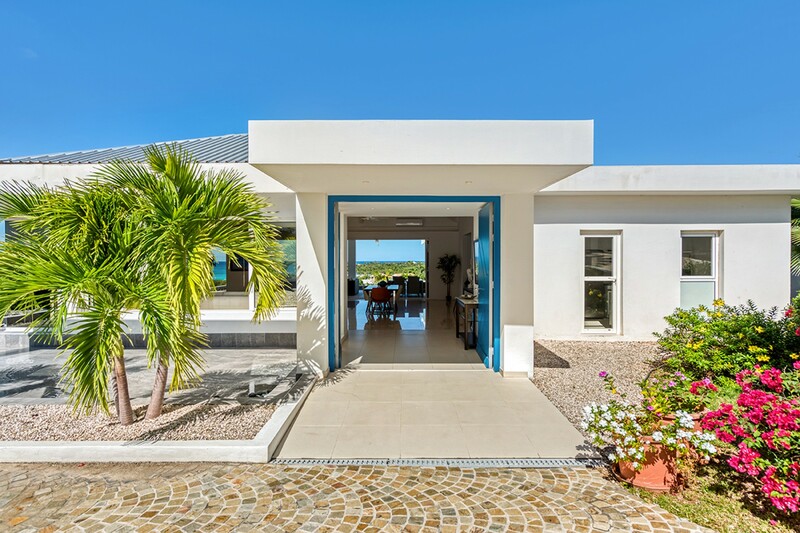 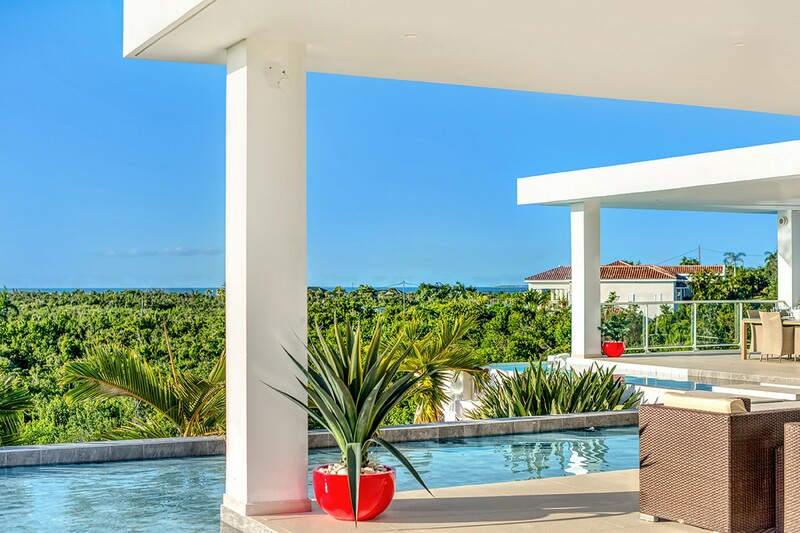 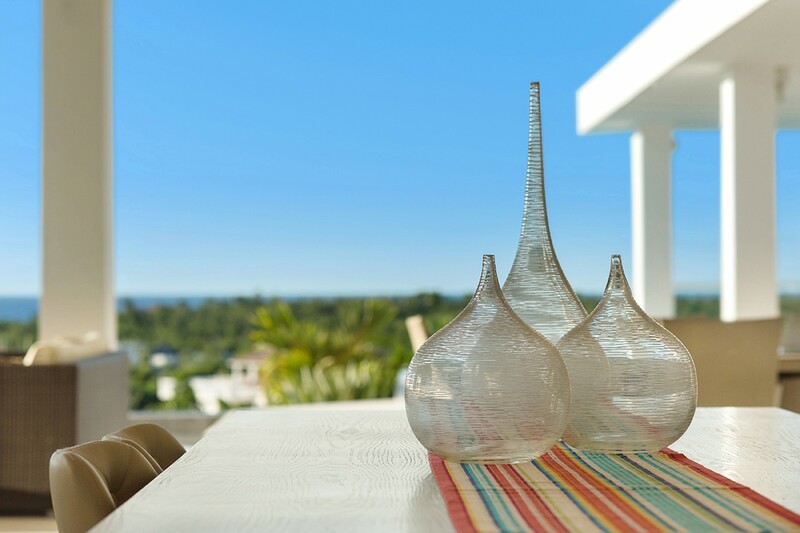 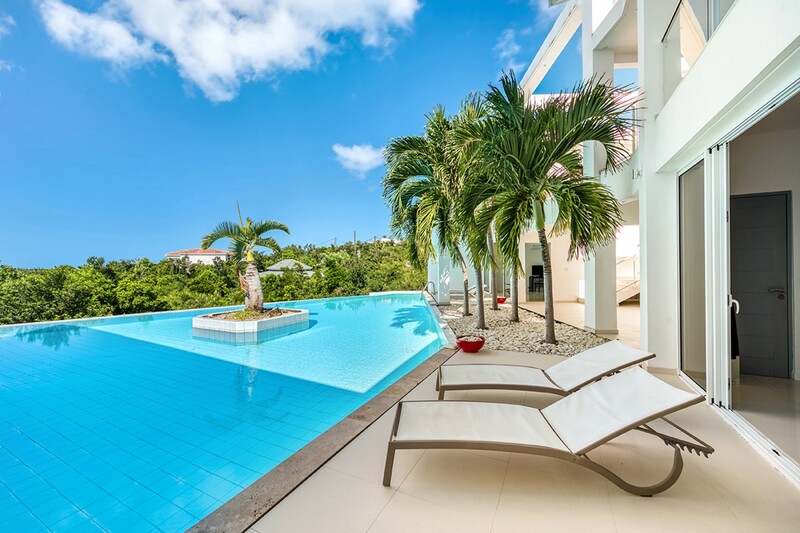 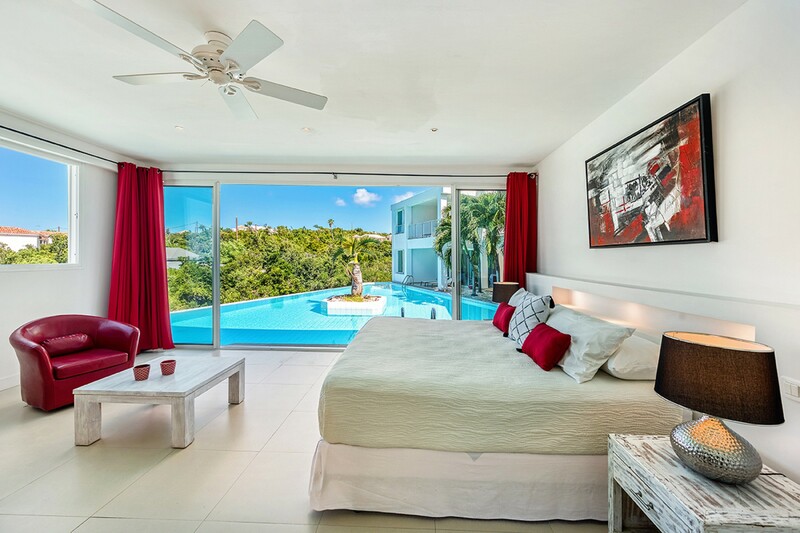 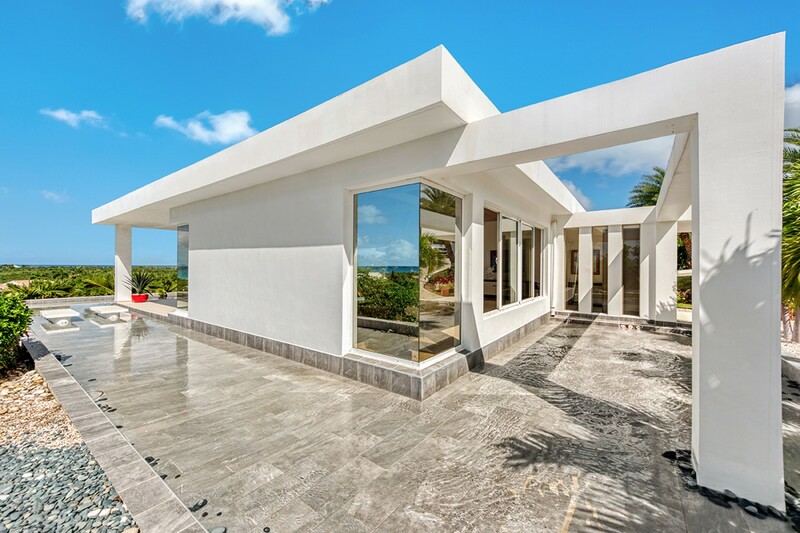 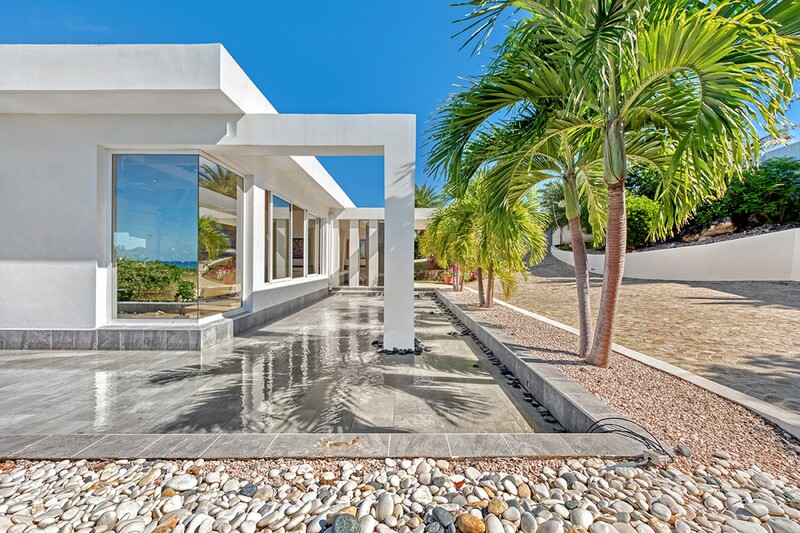 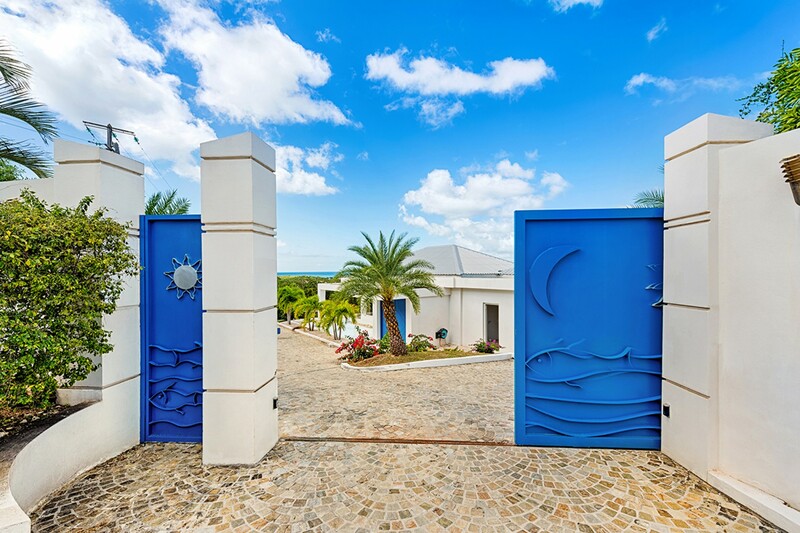 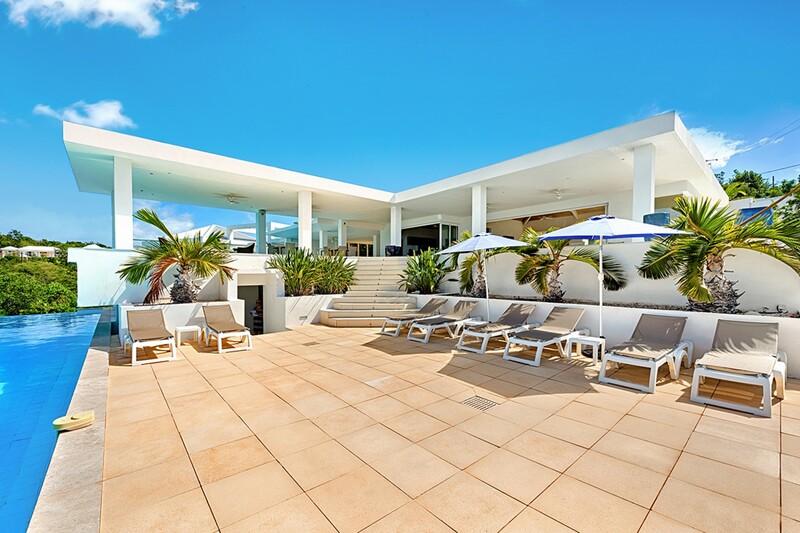 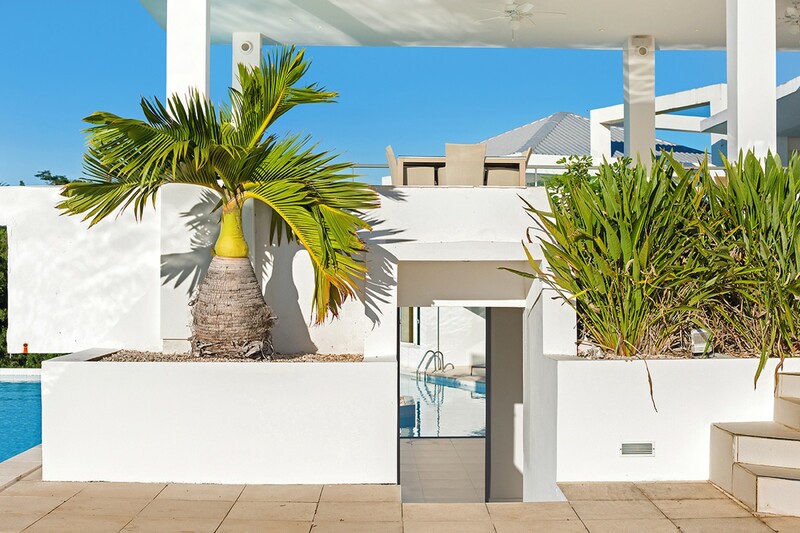 Without a doubt, the magical light and scenery in St Martin inspired this incredible 4 bedroom house. 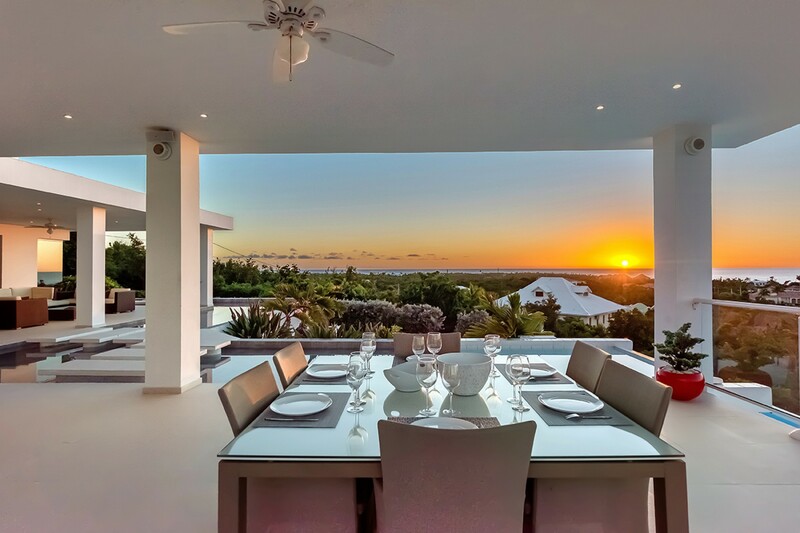 Built on 2 levels, it features huge panoramic windows which open right up to take full advantage of the spectacular views and lead directly onto the covered Terrace and swimming pools. 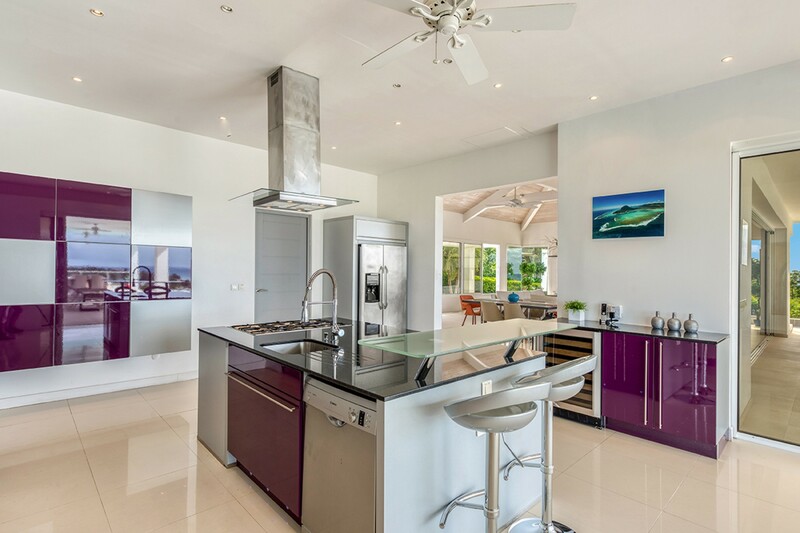 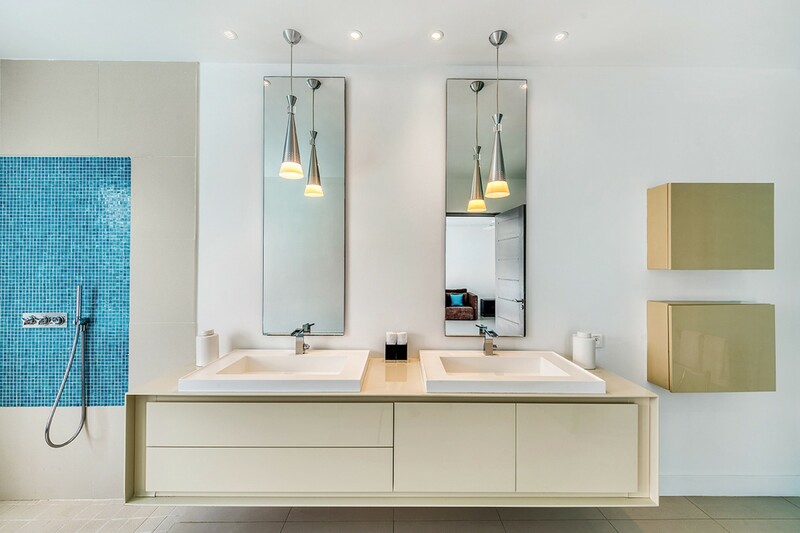 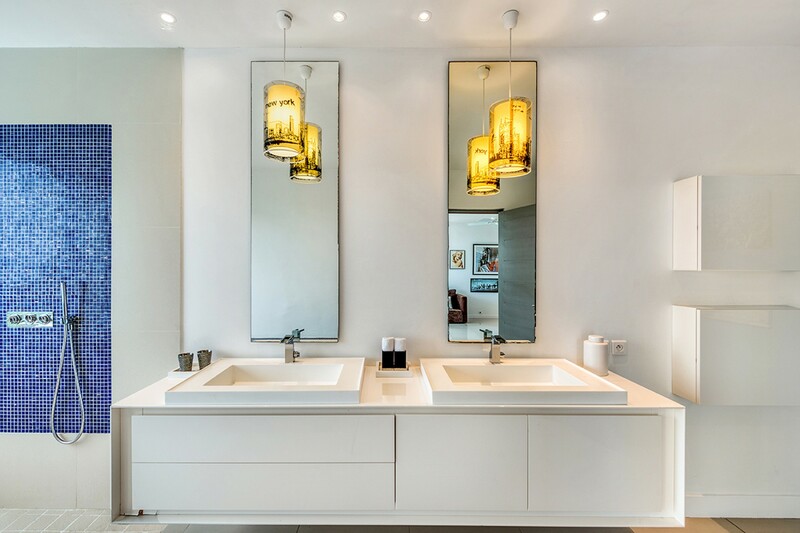 Grand Bleu is finished with contemporary elegant materials with an extremely modern kitchen and bespoke bathroom fittings. 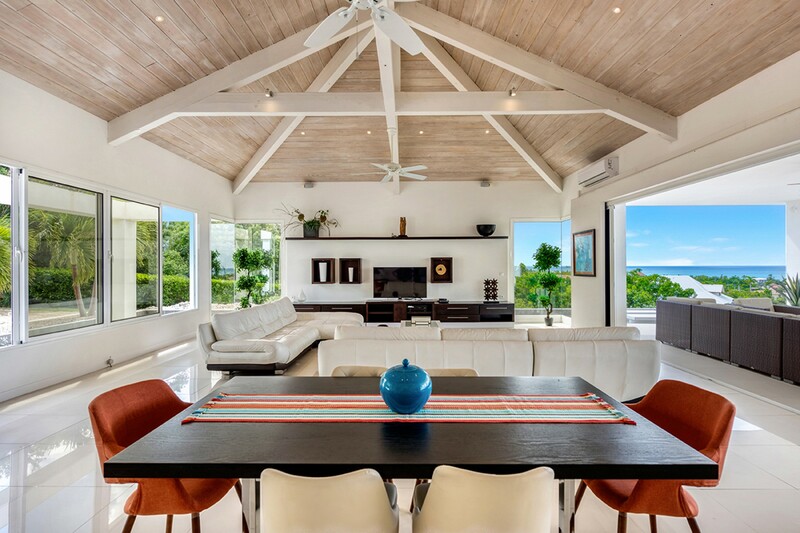 The interiors of the gorgeous chic Villa have been carefully selected to provide wonderful sophistication together with extreme relaxation. 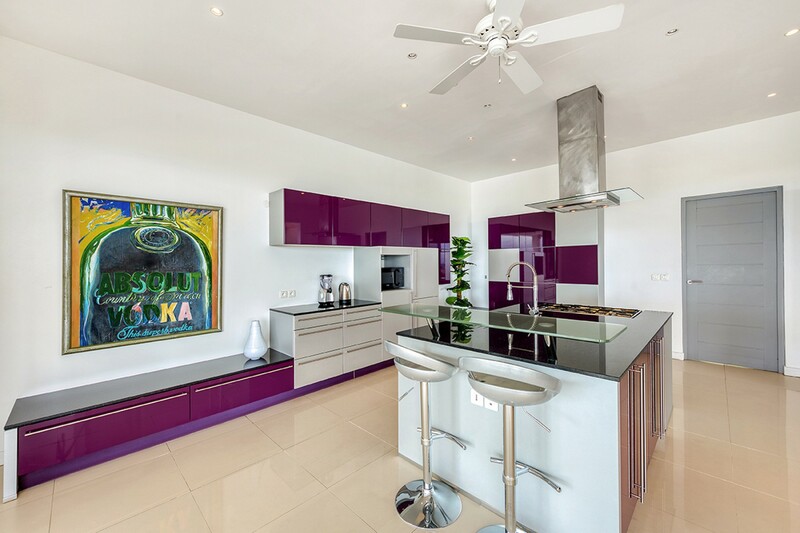 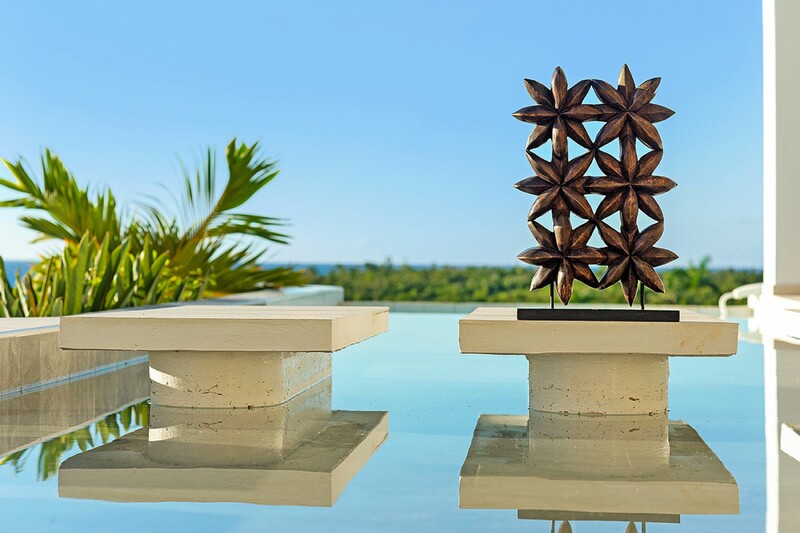 There are some beautiful contemporary artworks and the furnishings are quiet yet luxurious. 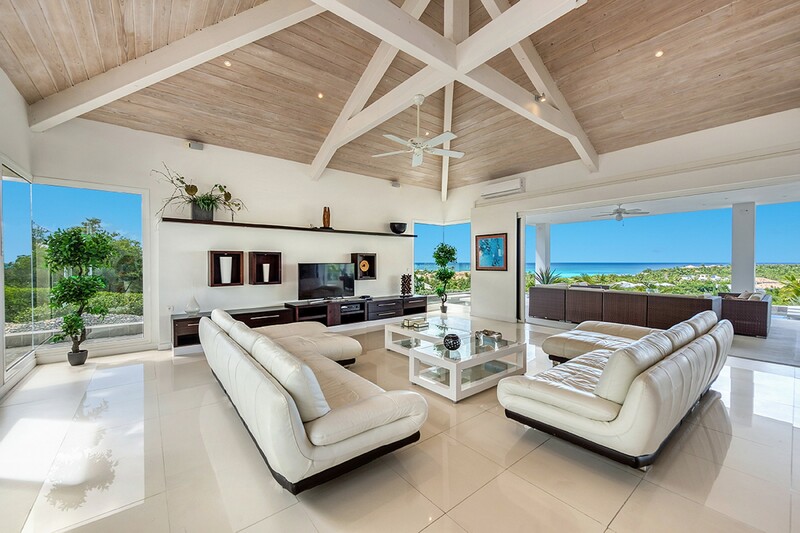 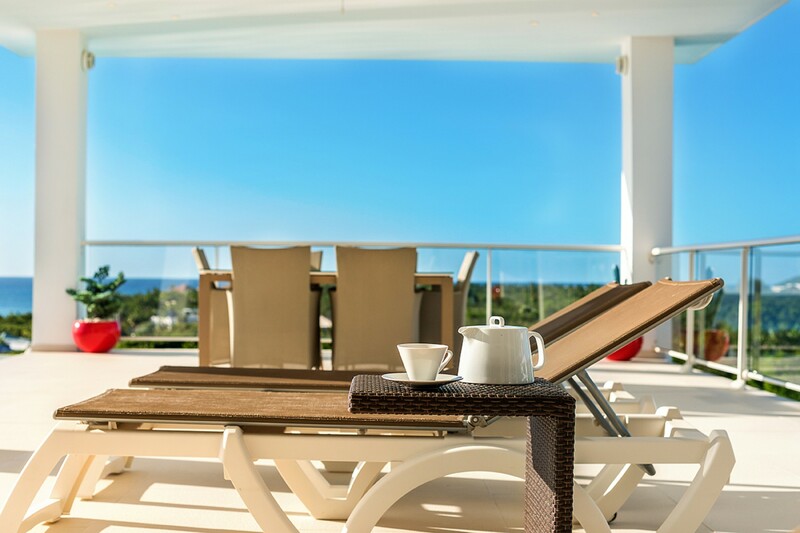 The open plan feature of Grand Bleu makes it the perfect villa to enjoy indoor/outdoor living at its best. 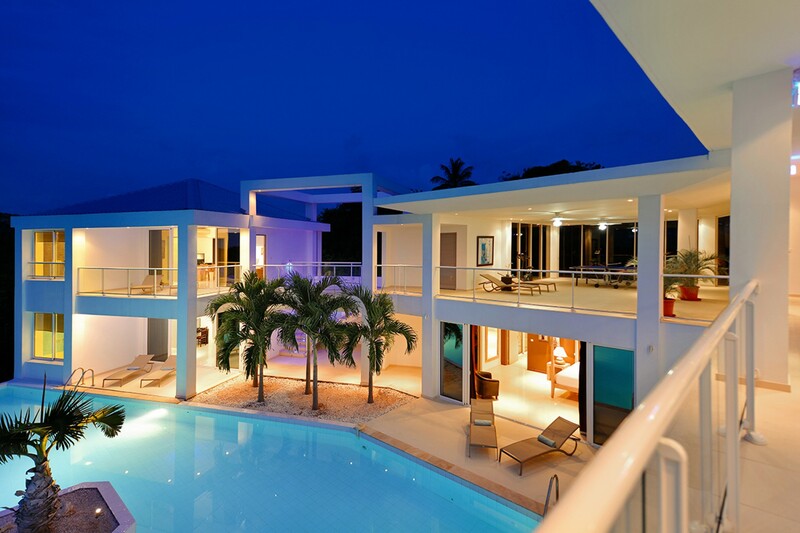 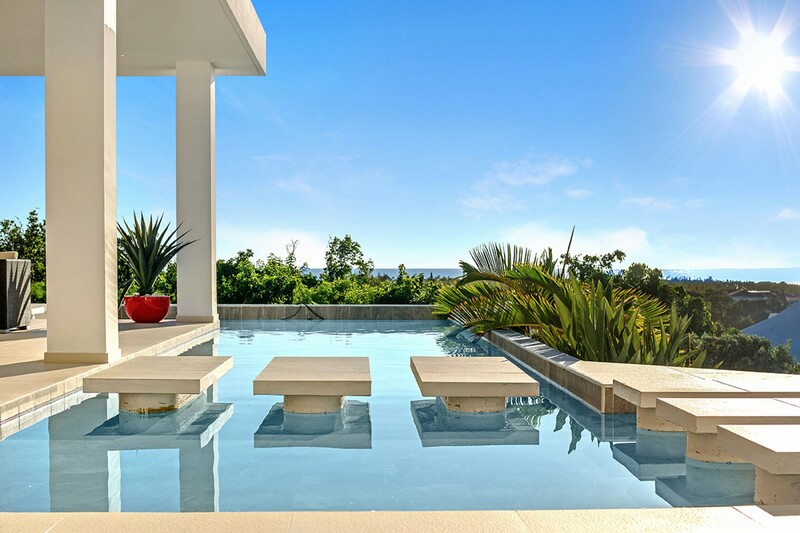 Two very large swimming pools! 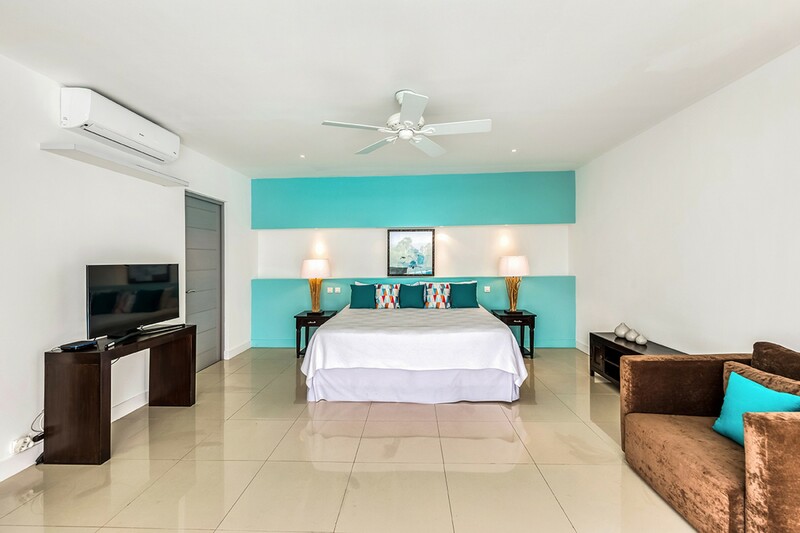 Each of the four bedrooms has a king size bed, air conditioning, ceiling fan, TV, DVD and a safe. 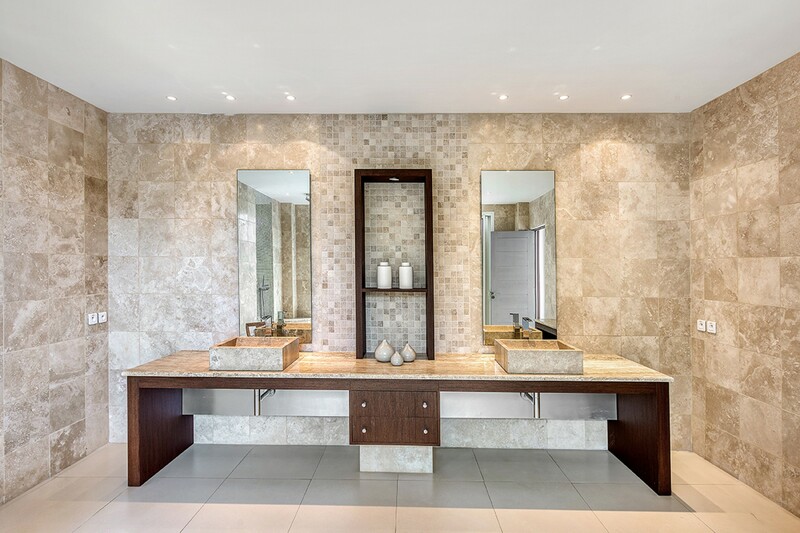 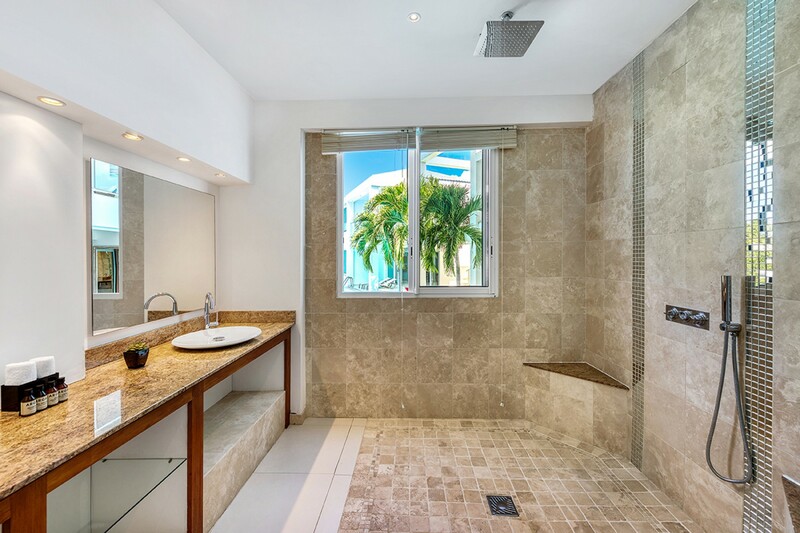 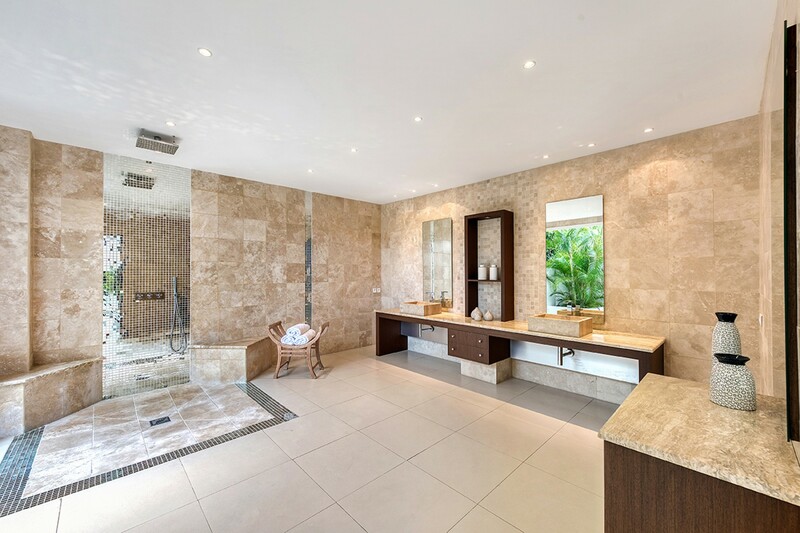 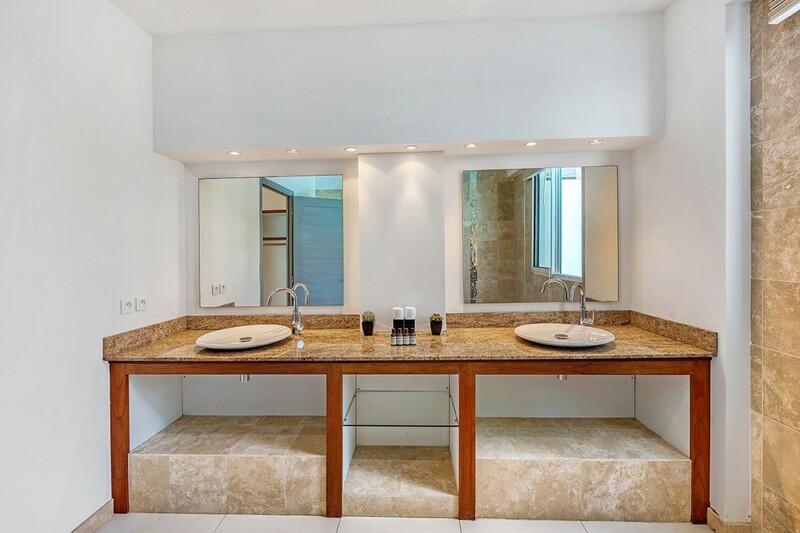 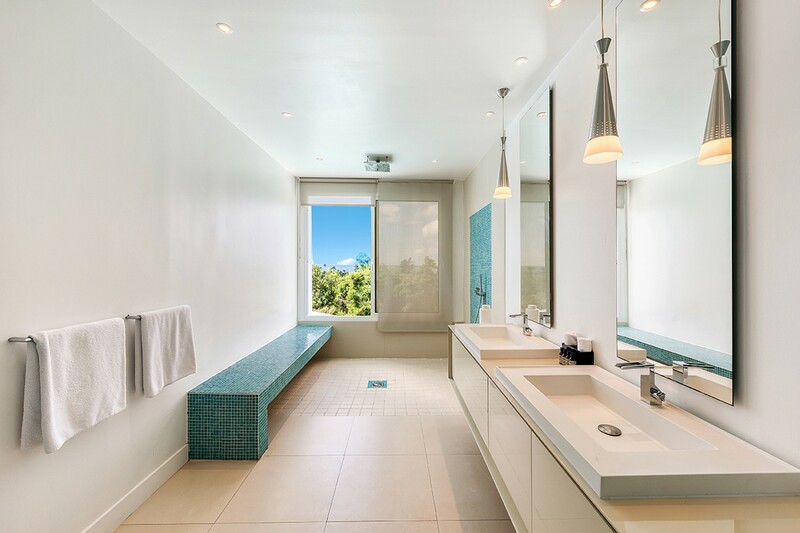 Each bedroom also has a private bathroom with a shower. 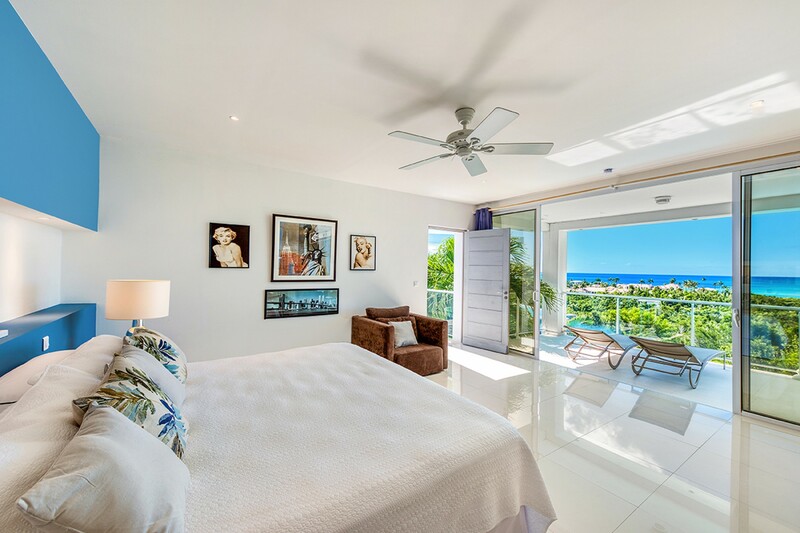 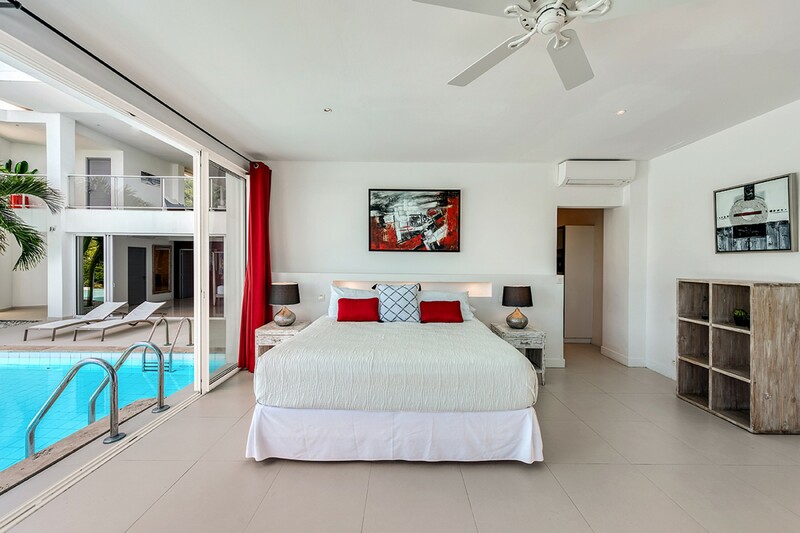 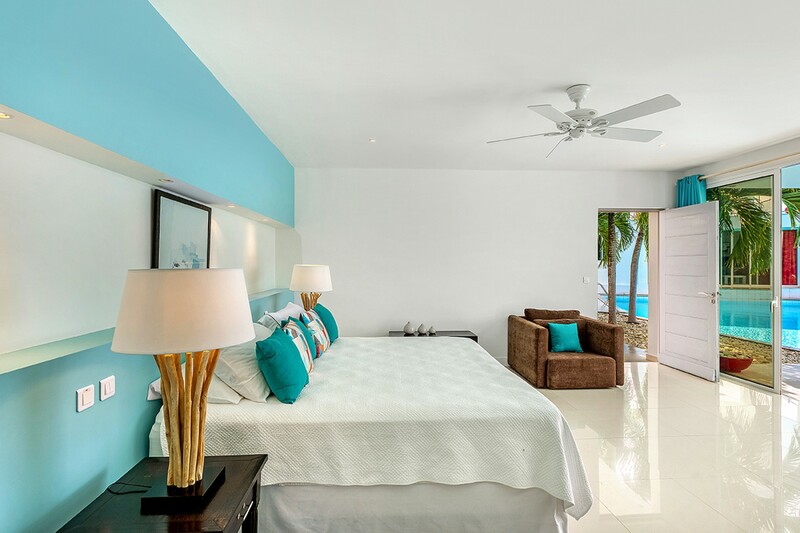 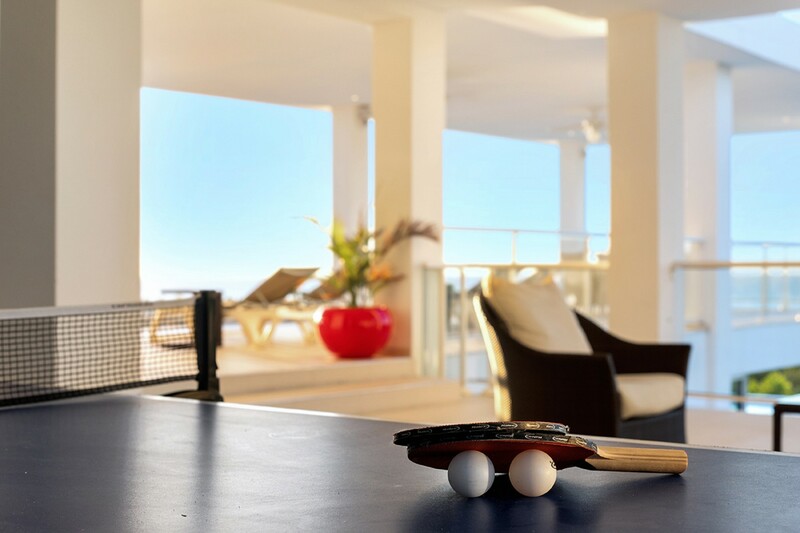 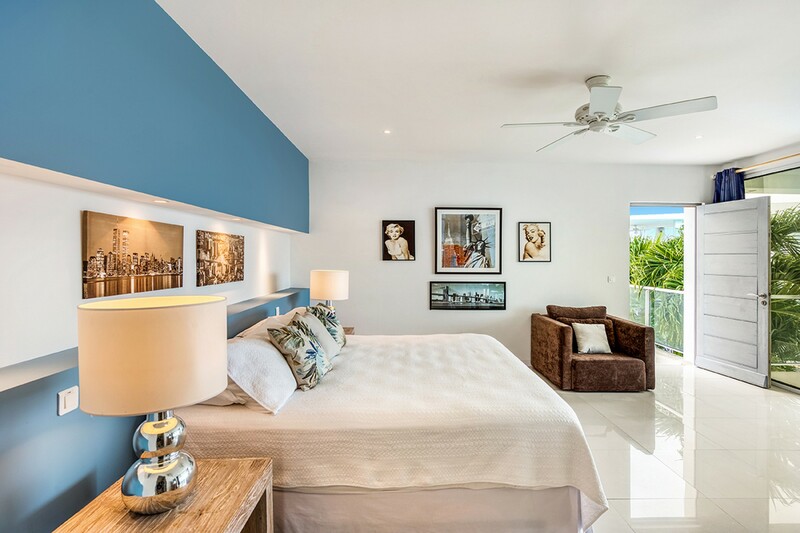 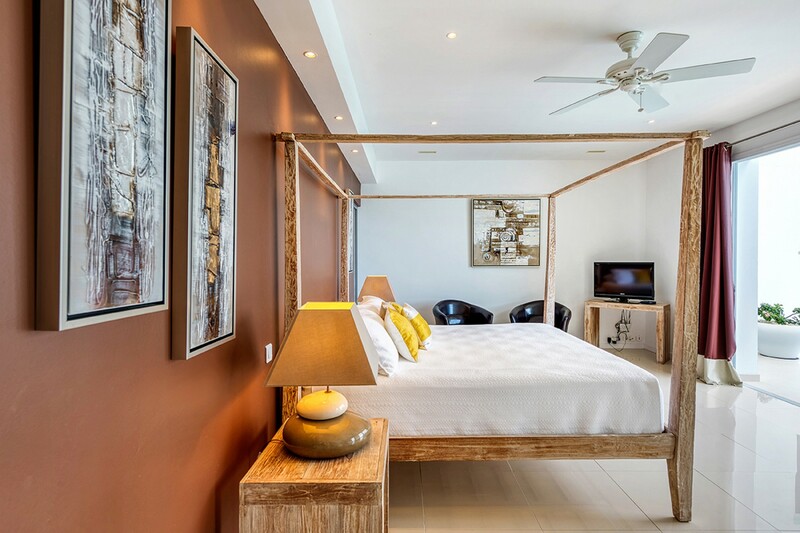 One of the bedroom is located on the main level with the three other bedrooms are located on the lower level with a direct access to the pools. 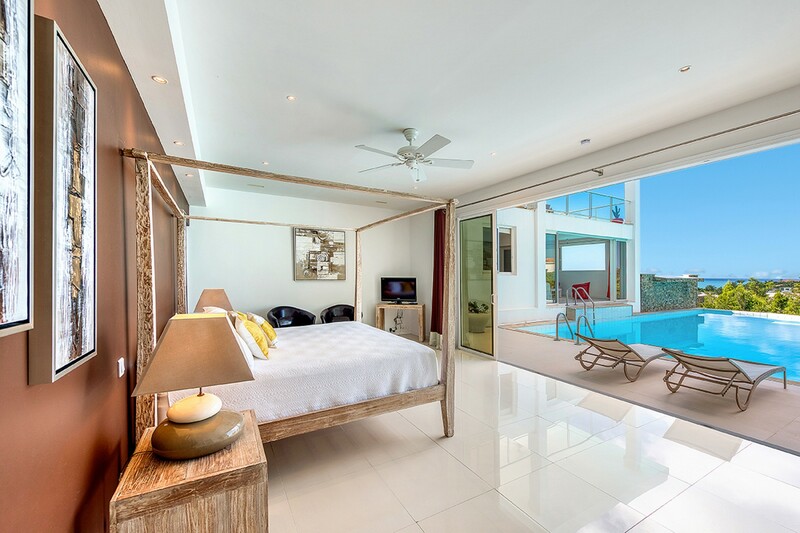 Can be rented as a 2-3 or 4 bedroom villa. 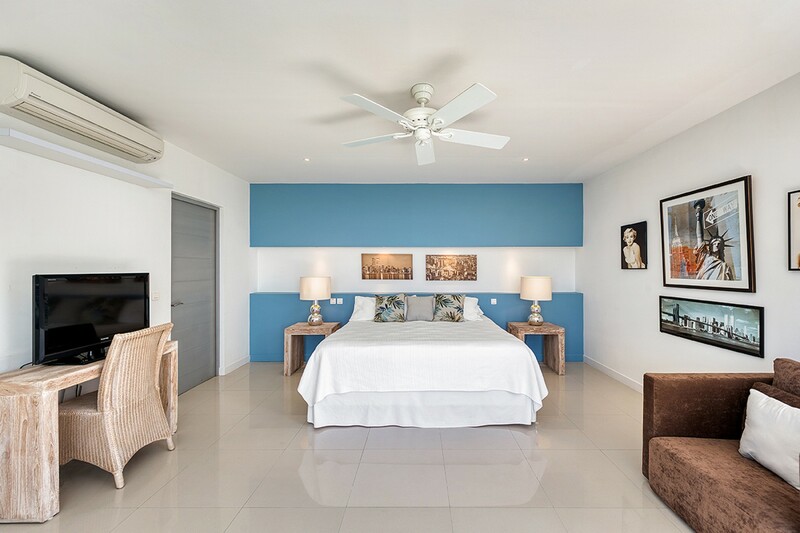 Contemporary and comfortable Furniture, Large Plasma TV, DVD, Satellite, CD/Tape and ceiling fan. 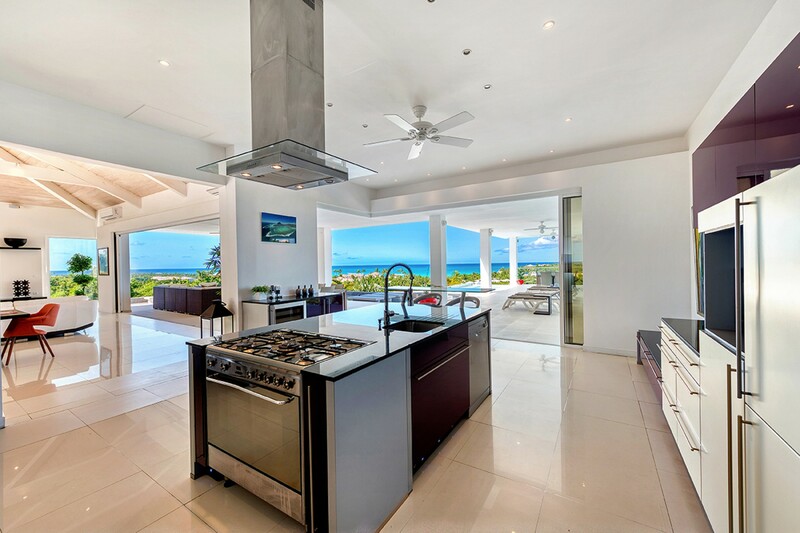 We had a great time in St. Martin. 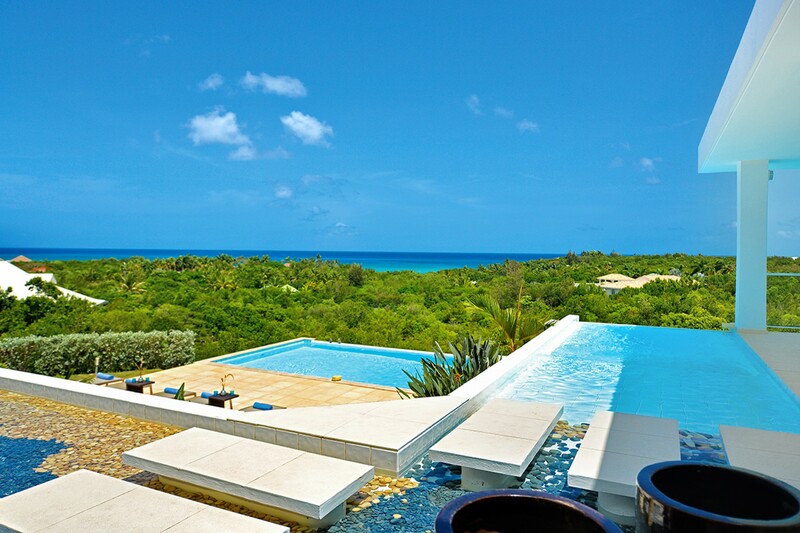 Grand Bleu far exceeded our expectations! 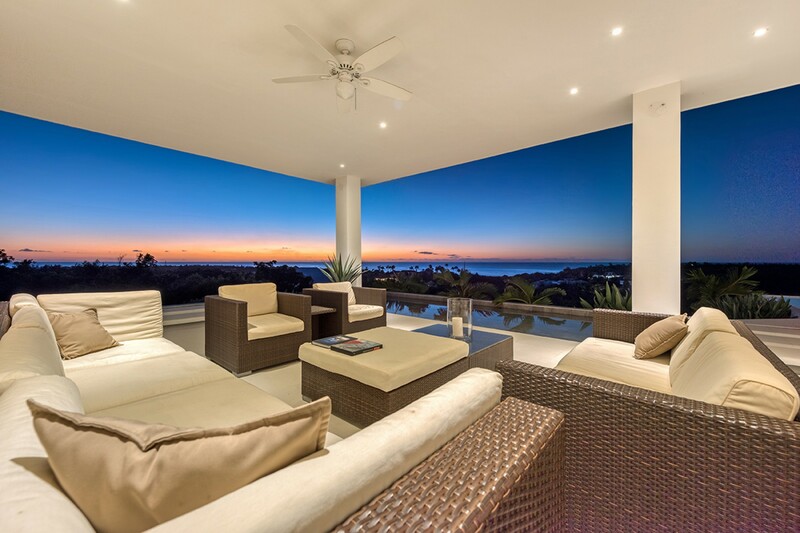 The house was beautiful, clean and had an amazing view. 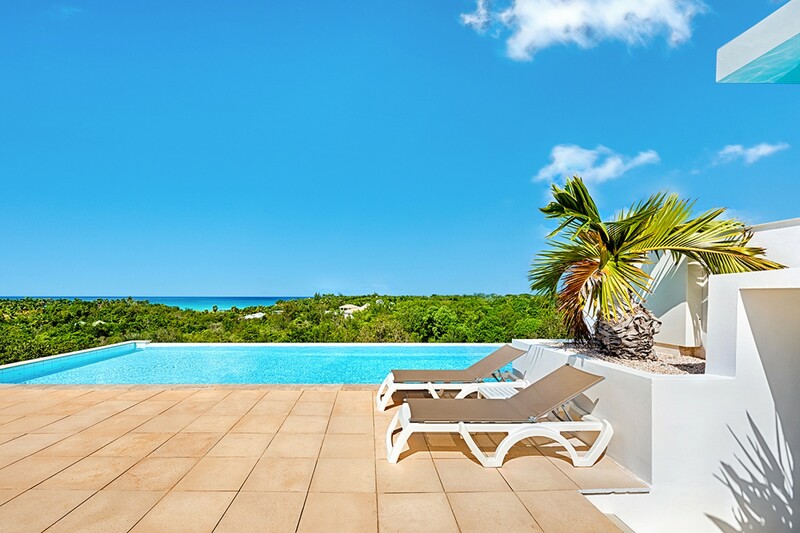 Thank you for all your help - we will most likely continue booking through your company for our future vacations, whether it is back to St. Martin or to somewhere else in the Caribbean! 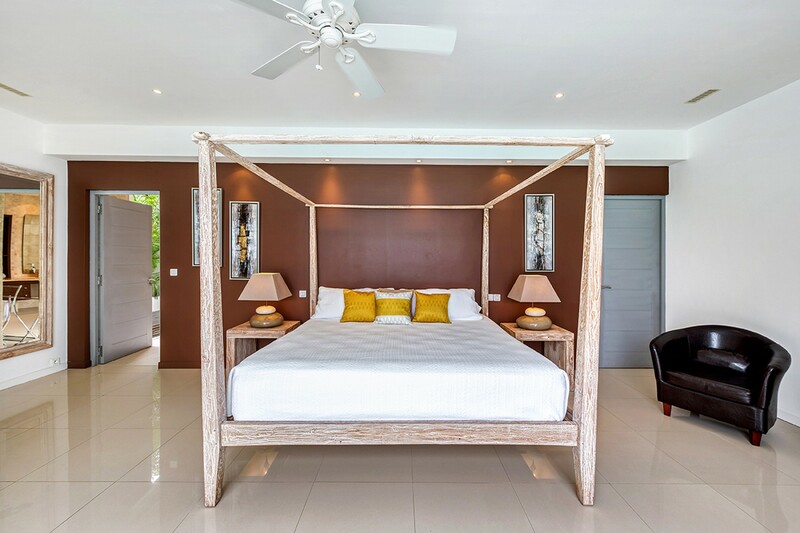 7th Night Free This promotion is not applicable between February 16-24th, April 13-27th & Nov 23-Dec 01st 2019, and on reservations already booked.